Chocolate Salted Caramel Wafer Cookies 2 oz. Salt Water Taffy � Chocolate Chiffon Taffy 2 oz. Buttery on Main Ultimate Chocolate Chip Cookies 2 oz. Garlic Beef Sausage Chub 5 oz. Dolcetto Chocolate Cookies Bag .7 oz. Brie Creamy Cheese Spread 3.5 oz. 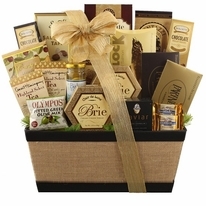 Looking for a classy, gourmet basket to give to your clients? 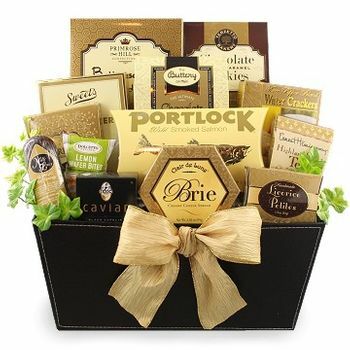 The Corporate Gold Gift basket is the perfect way to make a statement. 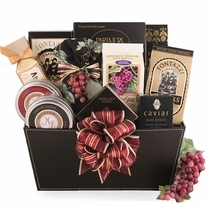 Each of these gourmet gift baskets have the best, high end treats that everyone loves. 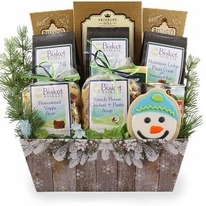 Smoked salmon, cheese, cookies, and a mix of candies are just some of the treats in our gourmet food gift baskets. 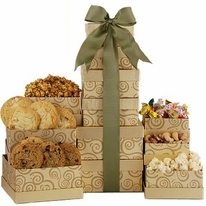 Additionally, these treats are wrapped up in a beautiful faux leather container that your recipient can reuse and enjoy again. All of our food gift baskets are assembled at the time of order, ensuring that they will be as fresh as possible for your recipient. Be sure to make an impression! Send a hand written note with your gourmet gift baskets by clicking on the button under the price.